If you have any questions regarding Juvenile Defense, please contact us for a FREE JUVENILE DISPOSITION CONSULTATION. 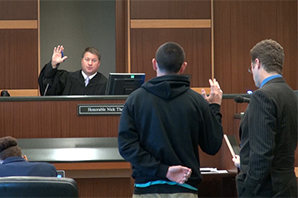 After the Juvenile Trial is complete and if the juvenile is convicted, a disposition hearing is conducted. The judge determines the appropriate penalties for the juvenile offense. If you need an effective Juvenile Defense Attorney, please contact us for a FREE JUVENILE DISPOSITION CONSULTATION.